Display typefaces are spaced for use at larger sizes. But since ‘large’ can refer to anything from 36 point to over a foot tall, display settings might still benefit from some adjusting that takes into account where and how they will be used. For instance, when type is set really large – as on billboards, signage, and trade show booths – spacing may well start to look too open. Tightening it will help maintain good overall color and balance. Conversely, when the type is set in reverse or in low-resolution environments – both of which tend to make type appear tighter – the spacing might need to be opened up. 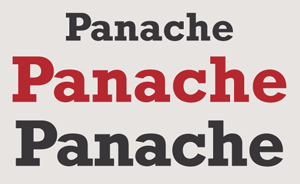 Text typefaces have more open spacing than those intended for display. Consequently, when using a text face for larger settings, consider tightening up the spacing via tracking. How much to tighten will depend on: the built-in spacing of the font; how large the type is being set; color and contrast, including background; and the medium (print, the Web, etc.). Any of these variables can affect how open or tight type looks. Light or white type on a dark background tends to look tighter than dark type on a light background. The degree to which this happens depends on several variables, including the typestyle, type size, length of copy, surface (if print), and medium. When this occurs, open up the tracking as necessary to maintain good spacing that does not appear too tight, maximizing readability. The relationships between characters can optically change as the type size changes. For this reason, even in a font that has been properly kerned for ‘general’ use, some pairs may appear too open or too tight when set larger or smaller than the intended size range. When this occurs, a bit of custom kerning can correct the imbalance. 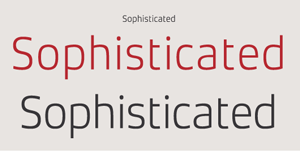 Just remember that less is more when it comes to custom kerning, so kern conservatively. Many a headline has been over-kerned in an attempt to even up the spacing. The spacing of Rockwell Bold looks just right when typeset at 72 point (upper), but can use a bit of tightening when set much larger, as shown in the lower setting with a tracking value of -20. Xenois Sans Light was spaced for use as a text face, but works well for display settings when the tracking is reduced. The lower setting is much improved with a tracking value of -30. When type is set in reverse, it can look tighter than when set on a white or light background (upper). If this occurs (middle), open up the tracking to compensate for the optical “tightening” effect. 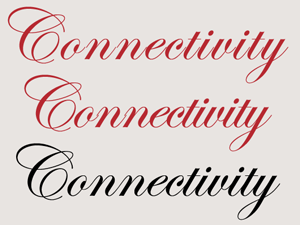 Resist tampering with the spacing of a connecting script such as ITC Edwardian Script as shown in the two upper settings, or you will disturb its perfectly joined glyphs. These decorative typestyles are designed and spaced to have perfectly connecting letterforms, whether the design contains only a few connecting pairs or many. Because of this, the overall letterspacing of a connecting script should not be altered as this can either open up or overlap connections that are designed and spaced to look natural and fluid. (The exception is when type is being set on a curve, causing connections to separate or overlap.) When non-connecting glyphs need a bit of kerning, do so judiciously and with care.